The early beginnings of the Golf Course on Galiano Island came about following the end of World War II in 1946. A section of the community joined together and raised sufficient funds to make a down payment on a mortgage, and purchased the present tract of land. Volunteer labour and elementary equipment completed the present nine holes layout. Regrettably, this band of dedicated golfers-to-be ran into hard times and faced foreclosure on their mortgage, but the course was saved by the intervention of resident, Captain Ivan Denroche, who purchased the mortgage and assumed ownership. Further improvements were made to the course, mostly on a volunteer basis and eventually a small combination owners' residence and Clubhouse was built. 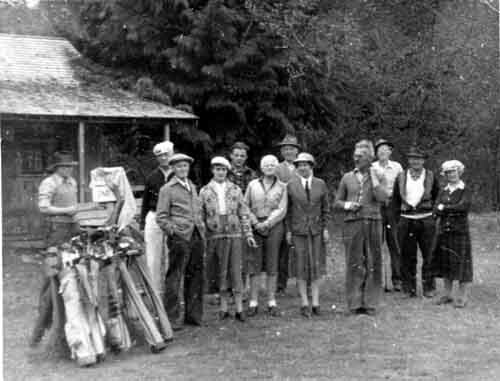 In 1958 the Galiano Golf and Country Club was formed and registered under the Societies Act and the Liquor Control Board granted a licence and the club soon became the recreational and social centre of the Island. Capt. Denroche continued to operate the club until June 1965 when it was sold to Mr. Robert Aston. Mr. Aston operated the club in the name of his holding company, B.C. Lodge Ltd., and leased the property to the Galiano Golf and Country Club. This situation continued until the 28th September 1974 when Mr. Aston, due to declining health, notified the Board of Directors that he would not be renewing the lease in 1975 and was putting the property on the market. On being advised by Mr. Aston of his intention to put the Golf Course up for sale, the club members and members of the community attempted to raise funds to purchase the property for the community. These attempts failed. The members, together with the Galiano Chamber of Commerce, and other resident non-club members wrote to the local Provincial politicians and the Minister of Lands, Forests, and Water Resources in an attempt to get the Province to purchase the property under the Greenbelt Fund. A petition was sent off. As a result of these representations the Provincial government agreed to purchase the property and in a press release dated December 2, 1974 stated that the Golf Club was "the main social meeting place for the Island community" and noted " the enthusiastic support from residents and visitors " and stated " the golf course would be operated as a public course open to residents and visitors alike."